How many things can go wrong when you’re trying to create a Google Ads account? A lot apparently. Yesterday I ran a training on Google Ads fundamentals to 15 people (for future trainings in Estonian check here) and during the break I realized that while I had been showing how to set up campaigns, most people hadn’t even managed to get access to their account. To complicate things further Google Ads has many different sign-up flows so 3 people trying to open an account might run into 3 different problems. These are just some of the issues we had so if you have come across any other issues leave a comment! Sign-up page doesn’t load up. 5-6 people had started the sign-up process and got to a page that just kept on loading and with every refresh they got to the same page. Some created multiple Ads accounts in the process. While writing this post I figured it would be nice to have a screenshot of the loading process and as luck would have it I was able to easily replicate the issue. This issue has been around for years in various forms so it’s not just the bug of the week. Check your e-mail to check if you didn’t get an e-mail from Google to confirm it’s you. Go to google.com/ads through an incognito window or another browser and try to log in first. An account might have already created before. If not proceed to creating the account in the incognito window. Try clearing your cache and cookies and do as advised in the previous step. A couple of people were sent to the AdWords Express (recently changed to “Smart” campaigns) flow and got stuck there. These campaigns won’t run in the country I did the training in (Estonia) so I’m not sure why these Smart campaigns thought it was a smart idea to send people there 🙂 Not sure if you’re running Smart campaigns? Check the icon next to your campaigns. 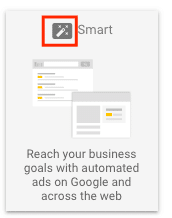 If you started the ads sign-up flow from within your Google My Business account then you most certainly ended up in the Smart campaign set-up flow. go through the campaign flow to create a dummy campaign, pause it and then you might be able to create a new standard campaign. If you can see search, reports and tools in the top right hand corner – congrats, you can now access standard Google Ads options. or try to find 3 dots in the top right corner (you might not have those) to move to standard ads. 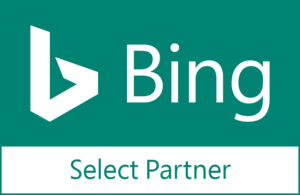 or contact Google Ads support. When you search for Google ads but end up on Google Adsense. On one occasion I advised people to search for Google ads to find the place where to sign up for AdWords and while I was next to the person I advised them to click on the first result (an ad with google.com as the URL came up and neither of us bothered to read the whole ad). This made them land on a page that was actually Google AdSense but it was almost identical to the AdWords (I’m saying AdWords instead of Google Ads name to make things a bit less confusing because AdSense is also, well Ads) home page and neither me nor the person realized that it was AdSense in the first couple of steps. Bonus: a few weeks ago a client had created a dummy campaign and entered a credit card (because otherwise they weren’t able to go through the sign-up flow) and ignored the account for a couple of weeks. They ended up spending €120 on the dummy campaign while they were waiting for their site to go live. 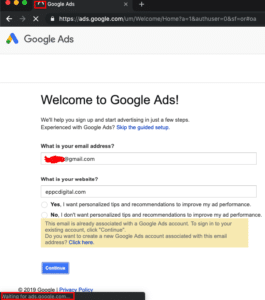 How to open a Google Ads account without a credit card? Some people were lucky as they were not required to enter a credit card right away. If you’re trying to open an account and you were not one of the lucky ones then you can open an account through an agency (MCC) account. Generally we open all our accounts through our MCC account and that process is flawless. If don’t want to wait until you get your hands on a company credit card you can enter your own personal credit card numbers to start with (make sure to pause the dummy campaigns though!) or create your own MCC account (it’s free). Have a look at this post for the instructions on how to do that. If you already have managed to create your Google Ads account and are wondering what are the different campaigns available check out this informative infographic.